Home : Blog : Mathematics : Can math be done better outdoors than indoors? Can math be done better outdoors than indoors? During the preschool years, a lot of math deals with classifying and categorizing objects into groups and sets. What better place than the outdoors to classify natural items such as grass, rocks, sticks, leaves and any other items that can be manipulated. An example would be a box full of rocks. 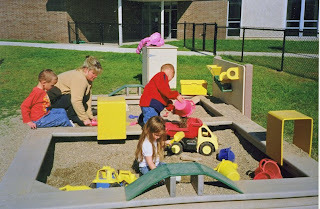 If children are provided with a pile of rocks of different and varying sizes, they could use it to meet the early learning standards by taking rocks and sorting them by size, shape, color, weight, etc. Once they have classified their rocks, they could actually break them into sets of similar items, and add and subtract rocks from the sets. I have been amazed over the years observing children who know nothing about early learning standards, who do not know anything about math, but are simply sitting and playing and they naturally sort and classify rocks or any other object. The Adventurous Child provides a container called a Truck Pit, which holds ?” diameter pea gravel and smaller, for children to do exactly this. Please contact me or comment on other things that you know children can manipulate outdoors and how they use it to practice the early learning standards and math.